CFKL 2014. Photo by David Lim. I stepped into a dance class for a university P.E. requirement, and haven’t stopped dancing since. I found my way to the Limon Dance School in New York, while dabbling in ballet, hip hop, and a B.A. in Political Science. I completed a Diploma in Dance at the Nanyang Academy of Fine Arts (Singapore) in 2011 and an MA (Contemporary Dance) at the London Contemporary Dance School in 2015. I enjoy blending conceptual, interactive, improvisatory and cross-cultural approaches for theatres, public spaces, performance installation and film. My work is often intimate and sometimes invasively personal, reaching for social issues, identity and gender. I've shared my work in Singapore, London, Indonesia, Thailand, Laos, Taiwan and Croatia. I work best in collaboration, and often with other members of the PG Gang (London), Cinemovement (Singapore) and Qontact Qimprovisation (Singapore) collectives. I have worked on the organisation of Contact Festival Kuala Lumpur and FangMae Khong International Dance Festival (Laos). I am inspired by my participation as a performer in the creative processes of Xavier le Roy, Charlotte Engelkes, Ole Khamchanla, Paolo Mangiola, Raka Maitra, Nirmala Seshadri, Patricia Toh, Ricky Sim and Peter Chin. My main physical practice at this time is Contact Improvisation. 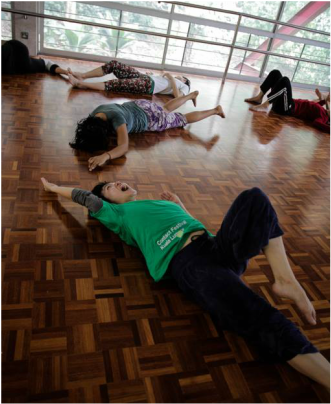 In past years I have facilitated the Contact Improv Singapore Community jams and events, and I have taught at the Lasalle College of the Arts and the Dance Nucleus in Singapore, as well as workshops in Malaysia, the Netherlands and in Taiwan. Major influences in my improv practice include Yeong Wen Lee, Nancy Stark Smith, Ray Chung, Karen Nelson, Angela Doniy, Chico Katsube and Shoko Kashima, Charlie Morrissey, and Scott Smith. I also maintain the Contact Improv Southeast Asia network. Before dancing, my earliest love was writing - scribbling silly short stories from the age of 10. These days, besides my blog, I have written for the Singapore Repertory Theatre Young Co. as Young Playwright in Residence (2006) and presented poetry and performance at the annual literary event ContraDiction 2007 and 2008. As a dance writer I have been published in Arts Equator, Artzine, themuse.com.sg, Aesthetics Magazine and the blog of the Singapore Arts Festival.